In 2017 the VAF awarded Thomas Jefferson’s Poplar Forest a grant from the Orlando V Fieldwork Fellowship Fund. 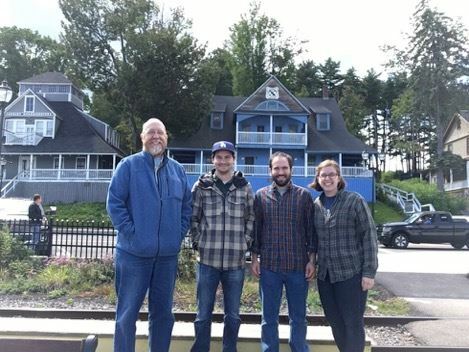 This grant helped defray the administrative costs of the Architectural History Field School program which from its beginning in 1990 was designed to lose money in order to attract students and young professionals. 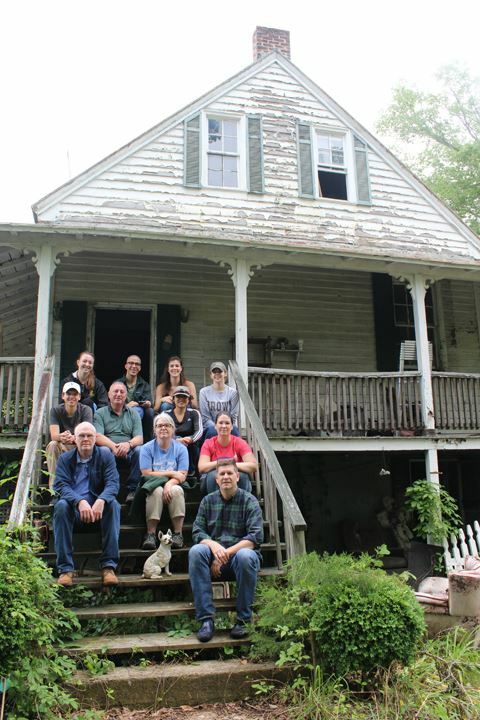 This intensive two week program is unique in its goal to convey the public history intersections of architectural history, historic preservation, fieldwork recording, public site interpretation, and museum house authenticity. 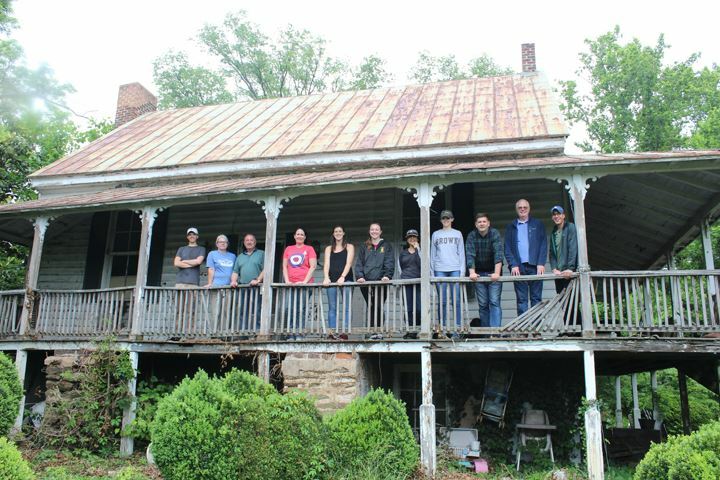 This year the program had the maximum enrollment of ten people, plus a graduate student in architectural history interning for the summer at Poplar Forest. These participants came from Alabama, Missouri, Illinois, Virginia, Colorado, Maryland, North Carolina, and Tennessee. The careers and backgrounds were typically diverse: professionals in state preservation offices; professionals in regional preservation; restoration architects; graduate students in architecture, history, interior design, and architectural history; a recently retired engineer; and the owner of an interior decorating business. The program focuses on understanding the complexity of restoring well-known larger museum properties and the challenges faced by very small museum properties. The best conservation and restoration practices are also explored at state institutions like The University of Virginia. The discipline and process of architectural restoration is absent from academic, falling between the cracks of many disciplines. This remains the reason for this program. 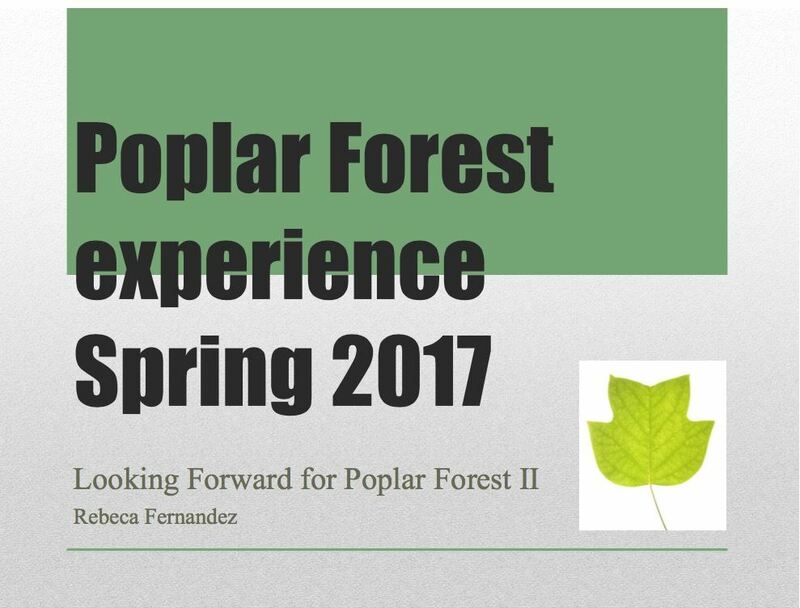 The program is taught from the perspective and history of Poplar Forest, whose idealistic process provides a private non-profit model. The history and architectural history of Thomas Jefferson is covered in great detail. The objective of the fourteen day program is to convey the complexity and may layers of historic house museums: investigation, conservation of materials, interpretation of physical evidence, methods of documentation, use of analytic tools such as paint and material analysis, philosophy of architectural restoration and interpretation, use of traditional materials and hand-crafted processes, methodology of historical archaeology and landscape archaeology, archaeological lab processes and artifact conservation, the best use of mechanical systems in historic buildings, interior furnishings and interpretation, and the ways in which architectural history and historic buildings are interpreted to the public. In addition to the professional restoration staff at Poplar Forest, other experts are brought in to lecture. Fieldtrips take participants to see the behind-the-scenes restoration work at Monticello, Montpelier, and The University of Virginia where the restoration staff provide insight on current work. 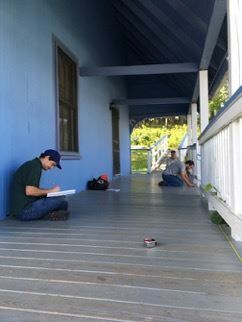 One of the more practical parts of the program is a fieldwork exercise of investigating and documenting an old building. 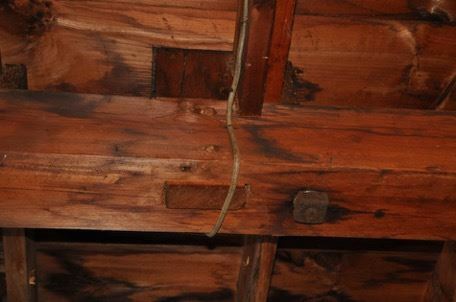 Each year an early building in the region is selected based on some need, whether it is documentation before demolition, creating awareness to facilitate preservation of a structure, or contributing to the heritage record at the county and state level. Each site usually has one thing in common: they have never been recorded. Buildings with an evolutionary history of change and ones with mysteries to solve are prime candidates. The typical two-day investigation relies on dating a building through physical clues without documentary history. The exercise, which for most participants is a new experience, is about how to look at a building and figure out its date and physical history. The group works as a team during the investigation and then as a team in the final week compiling the documentation into a draft report that is later edited, printed, and distributed to the group, to the owner of the property, and to the state preservation office. This year the property was Clement Hill, an eighteenth-century house with many changes that was either going to be demolished or given to the small town where it is located. The field school report provided documentation on the house for either of its future scenarios, hopefully influencing its preservation. It included analysis of molding types, nails, paint finishes, mortar and plaster, landscape features, and outbuildings. 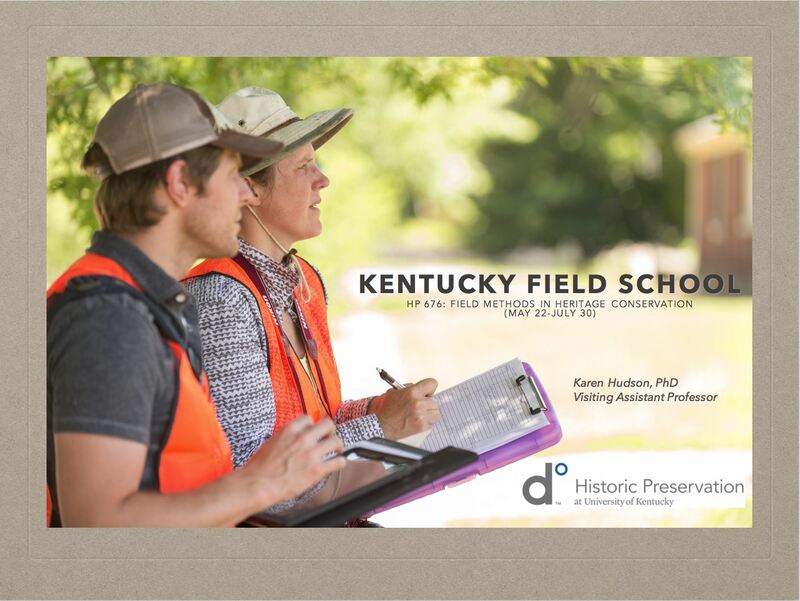 While this type of documentation is a steep learning curve for a two day project, it provides an exciting hands-on experience that conveys the lessons of why fieldwork is important. The fieldwork connection to museum house restoration is perhaps an obvious one for professionals but not to the general public. In order to know what to restore, you must know the regional context for the details you are examining, or the ones you will be restoring. In the past the field school project has recorded buildings that are now gone or severely altered, has educated property owners, has convinced owners to preserve rather than demolish buildings, and has contributed to the architectural heritage at the local, regional, and state level. The 2016 Summer Field School in Cultural Landscapes and Vernacular Architecture was a truly enriching experience. Under the guidance of Université Laval professor Tania Martin, we developed an understanding and appreciation for vernacular architecture in cultural landscapes. We were based in Cap-des-Rosiers, a former fishing village at the edge of the Forillon National Park of Canada on the north side of the Gaspe Peninsula. We wanted to understand how the unique landscape of the Gaspe Peninsula had influenced local architecture. We were also interested in studying how the built environment and social fabric of the community were impacted by the process of mass expropriation that took place to allow the creation of the National Park. We adopted research-action as a guiding principle, which is to say that we worked with the people of Cap-des-Rosiers to define our research questions. Our local correspondent believed that the Summer Field School could act as a catalyst, bringing the residents to reflect on their community, while the students could use their skills to help shape the resident’s aspirations. Throughout our stay, we had multiple occasions to interact with the community through organised discussions and spontaneous conversations. As we walked through the village, the people of Cap-des-Rosiers would stop us to tell us stories about the village, point out a building significant for them or to mention what they would like to see in the village in the future. At the end of our stay, we presented a summary of our findings as well as a design project based on the idea that the enhancement of the vernacular landscape can act as a foundation on which local entrepreneurs can build promising projects directed to improve the sense of community, going against the current approach that is almost exclusively centered on tourism. As a graduate student in architecture and urban design, this field school has given me the opportunity to learn how to read vernacular architectural elements, to recognize the different types of constructions, and to understand how ordinary landscapes inform us on the history, the lifestyle and the culture of the people through their built heritage. A number of hand-on experiences also allowed us to learn and practice the proper technique of field surveys. I believe these skills will help me in my future practice as an architect to rehabilitate heritage constructions in a way that is true to the craftsmanship of the original builders, respectful of the past and brings satisfaction to the community. The field school in which I participated took place in the small costal village of Cap- des-Rosiers in the region of Gaspe, Quebec. The main goal of the class was to get acquainted with, study and understand the cultural landscape and the built heritage of the town and the region. At the end of our three week stay, we proposed ideas and projects to help invigorate the economy and the social network of the village. To understand the past, we went through archives at the Gaspe national archive center, read numerous books, analyzed historic photos and met with locals and listened to their stories. This helped us sense where the community and its vernacular architecture come from and understand the village’s structure. We also surveyed ‘La Saline’, a former fishing building near the old cove that was use to barrel the world famous ‘Gaspe cure’. We did a windshield survey of the village and identified many local patterns. We also met with the community for a one day public consultation and brainstorming session. The content of those meetings mixed with our own observations on site helped us identify some of the village’s needs. With all this information in mind, we proposed different types of projets that could help the social and economic environment and improve the life of the inhabitants. The still-active New Hampshire Veterans Association (founded 1875) granted access to the team for one six-hour block of time on a date at which the buildings had not yet been closed for the season, but when renters did also not occupy them. Because of this limited access window, Stevenson chose to heavily focus the team’s efforts on two of the eight extant buildings from the site’s late nineteenth century period of significance: the uphill, summer cottage of the 15thNH Volunteer Infantry Regimental Association and the lakefront, shared summer cottage of the 9th and 11thNH Volunteer Infantry Regimental Associations Based on earlier reconnaissance visits, Stevenson chose the former due to its relative lack of modification after initial construction (1888) as a representative of the “typical” regimental cottage on the site at its height . He chose the latter, a building shared by two regimental associations (1888), to see if the use of space resembled that of individual unit structures despite its larger outward appearance and massing. As described in the fellowship application, the team used the methodology outlined in Thomas Carter’s and Elizabeth Collins Cromley’s An Invitation to Vernacular Architecture: A Guide to the Study of Ordinary Buildings and Landscapesto document these two buildings extensively. The team used traditional and laser tape measures, calling out incremental measurements to a team member, who recorded the values on a pre-drawn, rough outline on graph paper. This work most importantly produced measured field drawings, from which finished floor plans can be produced in AutoCAD at a later date. 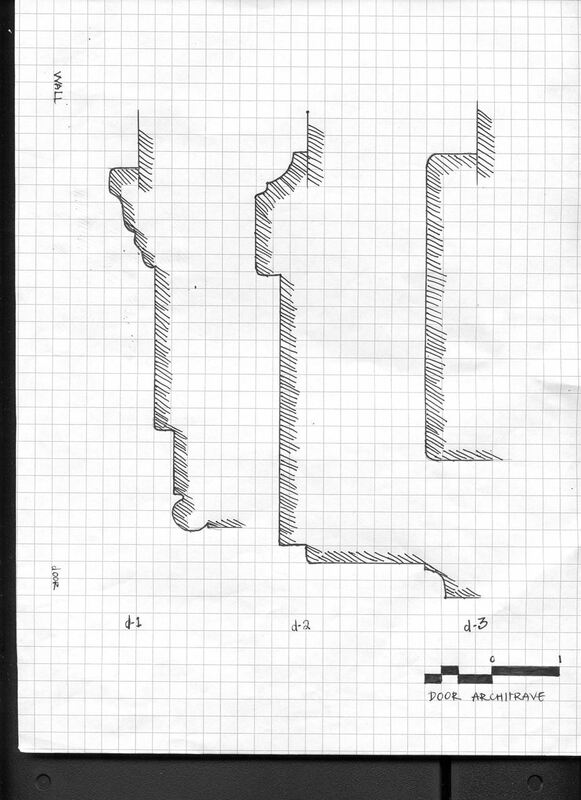 In addition to making measured drawings of the interior and exterior spaces, the team made extensive photographic documentation of exterior and interior finishes , recording observations of periods of architectural intervention in the early 20thcentury (kitchens) and in the 1970s/1980s for bathroom remodels and additions. In true VAF fashion, the team scurried up latters into unfinished, mouse-drop-laden attics and other spaces. Stevenson will analyze the floor plans, observational field notes, and photography as he prepares his relevant dissertation chapter. For the remaining buildings on the site, the team conducted other field observations and photographic documentation. This proved invaluable in establishing future questions that construction materials suggested. For example, at the Cavalry Headquarters building (immediately adjacent the 9th/11thNH), the team observed a hybrid timberframe/balloon frame construction method that also featured iron reinforcing tie-rods. This combination helped create a massive open space around the central tripartite fireplace to allow for large gatherings of veterans around a central “campfire” experience alluded to in written primary sources. Thus, the fieldwork helps document and explain the ways architecture facilitated the social gatherings intended in the buildings.